Mac and Gina, the second string stars of The Wanderer have their moment in the sun in this second installment of the Thunder Point series. And what I adored was the take on the teenage romance department returns in full force. Mac's ex-wife shows up after abandoning the family ten years earlier, which of course, causes a bit of turmoil. Cooper and Sarah continue their romance started in that first book, but all is not perfect in their world when Cooper has to rush back to Texas for a family emergency and Sarah faces issues with work that may interrupt both her and Landon's life. This story really should have been titled "The Ex-es" since it seems almost all of the characters must deal with their ex-es in one way or another. So back to my favorite part: the romance between Landon and Eve as well as Gina's daughter, Ashley and a new romance with Downey. This romance brought all of the heartache only a teen can feel and imagine. There was a toss up between who I really wanted to kick to the curb: either CJ (Mac's ex) or Downey. Downey, I could almost forgive since he is young and may learn but CJ is old enough to know better. Again, Carr creates real characters with believable dialogue and a setting that is breath-taking. I would love to live in a place like Thunder Point, where everyone seems connected. There are also some new characters introduced like Spencer and Devon to be featured in the next installment The Hero. I also hope that the teens are well represented again. This book sounds fantstic. I love Robyn's writing. Thanks for the giveaway. It's always fun when secondary characters warrant their own story too! Thanks! Excellent review and I'm definitely adding this one to my must read list! Ty! Sounds like a fun read. Things are bound to get tricky with a long lost ex-wife involved. I would love to read this one. Thanks for having the giveaway. I love a small town series! Why do I keep reading these blogs and reviews and such like?!?!? I just keeping adding more and more authors, and more and more books, to my TBR lists!!! Thank you for bringing this one by Robyn Carr to my attention. I have read Robyn before and do like her voice. I will now have to give this title a try. Daily entry 7/4 - Happy 4th of July! These giveaways are awesome and very much appreciated. Thank you. I also truly like your site. Daily entry 7/5 - another hot day! I've started reading some of Robyn's earlier books. it's not quite as hot today! Thanks for hosting this review and giveaway. 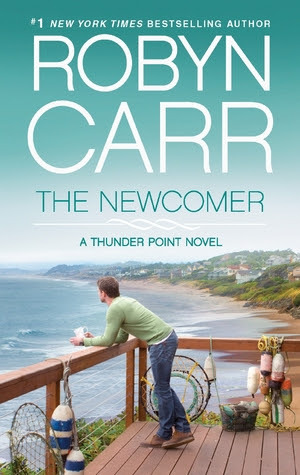 Robyn Carr and her Thunder Point books are in a prominent place on my TBR list.